New Orleans, La., jumped on the bike-share bandwagon just about a year ago, and while their blue shared bikes are a common enough sight downtown, lots of people haven’t tried them yet. So the city’s teamed up with Blue Cross and Blue Shield of Louisiana to get potential riders to try their blue bikes for the best price possible–free. City residents can try its Blue Bikes program for one hour every day in September for free. All they have to do is sign up. Current subscribers also received codes for a free hour per day, and everyone can ride for 13 cents per hour when their free time runs out. 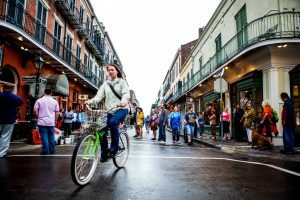 Will the free promotion boost bike-share in New Orleans? Time will tell. Check out the whole story here.